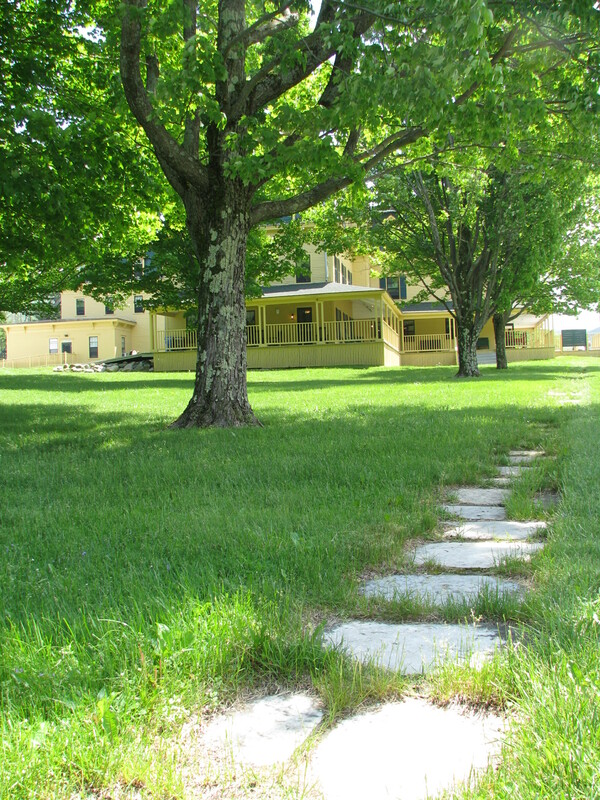 Vermont marble walkway, leading to the Bread Loaf Inn. Back in early June, I packed my too-heavy suitcase (too many books, too much paperwork) and left the horses and the garden and the weeds and the house in care of my husband. I was off to Vermont, to the verdant roll of hills thick with maple and birch, to woods skirted with hay-scented fern and incised with carefully mowed meadows. I went “Back East,” as we say here Out West, to attend the Bread Loaf Orion Environmental Writers’ conference, a gathering of essayists, poets, and fiction writers sharing time in the neighborhood where Robert Frost summered for decades. Navigating groups of people I don’t know brings surges of anxiety, but that subsided as the days went on and I practically wallowed in the luxury of being surrounded by scores of individuals who prize the written word. 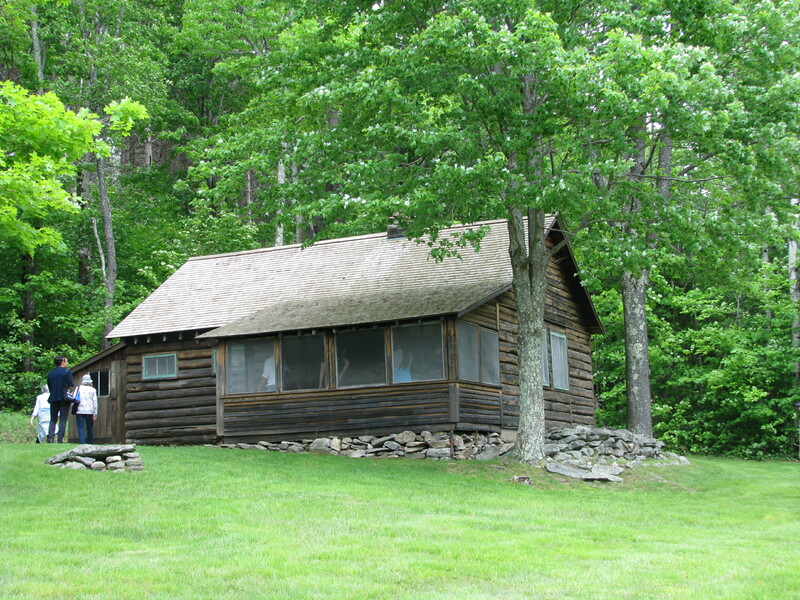 Visiting Robert Frost’s summer cabin. The pragmatic gear turning at the center of my days was a writing workshop led by Scott Russell Sanders. In our hours together, members of the group discussed one another’s work, the writing process, and the craft of personal essay. My newly-met colleagues are all smart, funny, and generous; I learned a lot and was—am—grateful for the workshop experience. When I think back on that week, though, it isn’t the nuts and bolts of writing that stands out, but the alchemy of it. Writing casts a spell. Reading, we fall under it, defying the laws of time and space to journey beyond the confines of physical location and personal moment. That this happens even in my chosen genre of nonfiction, where the contract between author and reader specifies real-life truthfulness, only adds to the sense of enchantment. This conjuring is a do-it-yourself project, an interior passage—usually. At the conference, our days were bookended with faculty presentations: lectures in the morning and readings to close the day (or, depending on your point of view, as a prelude to the opening of the Barn Pub). As each author took his or her turn at the lectern and began to speak, their words were layered with the sensory details of the place: the angular shadows of the Little Theater’s dark wooden beams, soft air and the chitter of chimney swifts drifting through the open double doors in the mornings, the incense of woodsmoke and the snap of flame in the open fireplace on chilly evenings at mid-week, the laughter and small murmurs of agreement—and occasional outbursts of whooping and applause—from the audience of compatriots. Like cloisonné, or a lacquering technique, the overlay of voice and space and scent and language created occasions gleaming with unexpected depth. The power of writing doesn’t require an in-person reading, of course. Listening to a writer is an embellishment on an exchange of ideas that benefits from but does not require the flourish. But hearing an author read aloud wrinkles time a little, invoking the ancestral oral tradition from which written technology sprang eons ago. Those readings and talks at Bread Loaf were temporal, too, in their transience and in the steady accumulation of days between then and now. I carried their echoes home in memory, though, and packed as books in my then-still-heavier suitcase, their substance captive on paper. 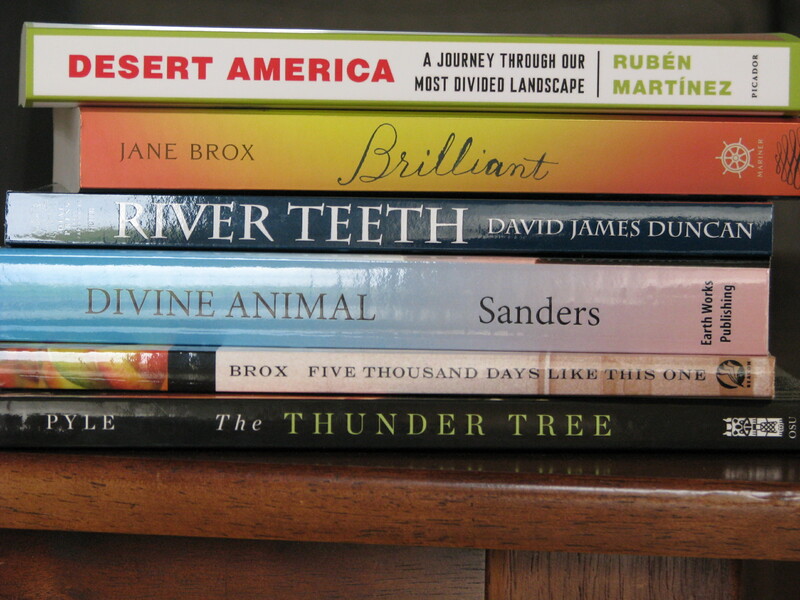 Now, whenever I start to read the work of Jane Brox or Robert Michael Pyle or David James Duncan or Scott Sanders, I’ll hear the cadence and rhythm of their voices in my mind’s ear. Even more wonderful is that I have sensory snapshots to draw on as I explore poetry and fiction by writers I wasn’t familiar with before—Rubén Martínez, Belle Boggs, Maurice Manning, and Aimee Nezhukumatathil. These voices, new to me, rang in from the periphery of my nonfiction perspective, gently suggesting that what I think of as focus might just as easily be tunnel vision. And, because Scott Sanders had each participant read a passage from our work-in-progress before the group discussed it, I’ll also be able to hear the voices and see the faces of the women from my workshop group, writers I’ll no doubt be reading more from in the future. 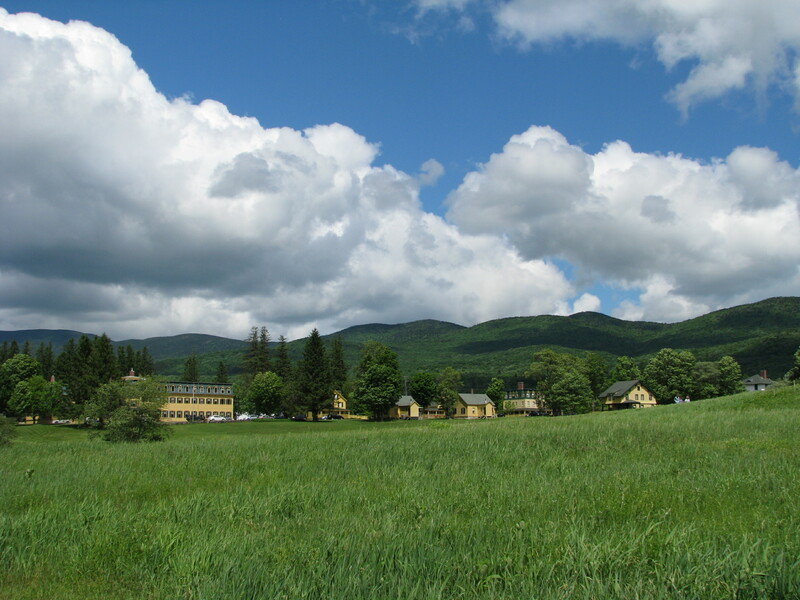 This entry was posted in reading, travel, writing and tagged #orionatbreadloaf, Bread Loaf Orion Environmental Writers' Conference, Scott Russell Sanders, the writing life. Bookmark the permalink. Bonnie, thanks so much for your kind words. The conference was a great experience and I’m so glad we connected. Wishing you good writing!